I was in Thailand earlier this month. 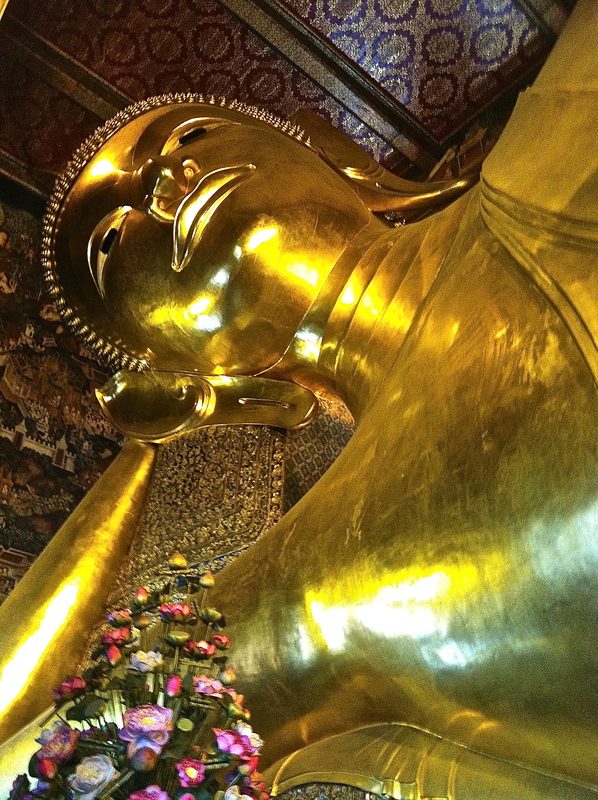 The first thing I wanted to see after arriving in Bangkok was the magnificent “Reclining Buddha.” This amazing work of golden art is so large it takes at least 10 minutes to walk around it. I love stories, but who needs stories when real life provides direct experience- beyond words? To lay down, to give up assertion for awhile- to suspend the need to be correct, best, kind, fair, to perform in any way, to let defenses down, to rest into the support of the earth and the universe. To just watch as infinity unfolds all around me. ….ah. I like to think the artists who created this great work did so in the same spirit, that to make this reclining figure enormous in size and solid gold was a way of expressing the power of knowing you can do so much, but choosing to abandon all effort. Just let the universe take care of itself for awhile. To watch and learn from it’s ways. We practice a restorative pose that rests in the very same shape- on our side, head usually supported by a prop rather than our hand. Usually the posture is called sidelying savasana or reclining Buddha. I go one step further and call it “Lazy BUddha.” I love to be reminded that the real Buddhas are just people and no matter how enlightened we are, we never escape laziness. In fact, surely someone who helps liberate others can have a moment just to “check out” for no good reason, without having to “earn” that right.